A Couple Didn't Want To Have Dinner Near Cops, So Officers Paid Their Bill IN FULL! A Couple Didn’t Want To Have Dinner Near Cops, So Officers Paid Their Bill IN FULL! Consider my faith in humanity restored. While the country struggles to find out what side it’s on regarding the killings of cops, gun control, and racial divides within the public, you almost forget that cops still have a job to do, regardless of political affiliation and regardless of who’s trying to lay blame on the faults of society. The men and women of law enforcement are the ones keeping our neighborhoods safe and the ones going into harm’s way when things rolls downhill. That’s why this story is so damn heartwarming – it tells the real story of cops around the country – the ones trying to really make a difference in their communities. 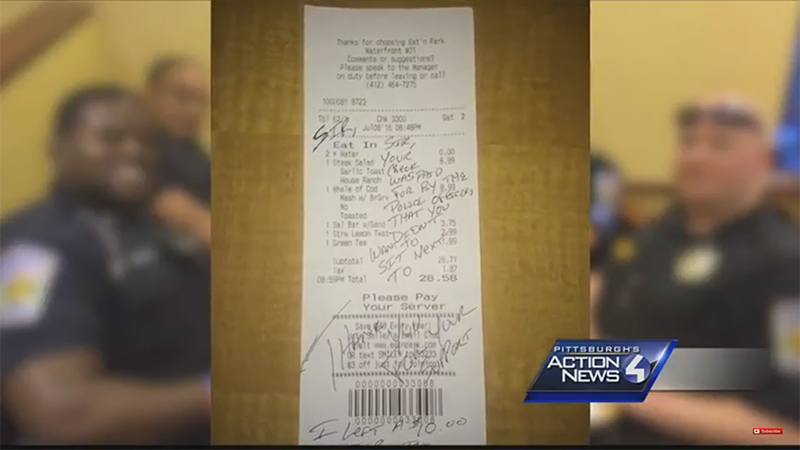 A group of police officers at a Pittsburgh area restaurant picked up the bill for a man and woman after the couple made it clear they didn’t want to sit near them at a diner on Saturday. A waiter at the Eat N’Park diner in Homestead said the man looked over at the table of officers and “was like, ‘Nah, I don’t want to sit here. '” So, they got moved to an opposite side of the restaurant. Officer Chuck Thomas said he tried to reassure the man, saying “It’s okay sir. You won’t have to worry about it, we won’t hurt you.” But the man looked back at the officer and said he wouldn’t sit there and walked away. The bill was $28.50, and they tipped $10 on top. “It just dawned on me, I should do this real quick just to show this guy look, I don’t know if you had bad experience with the police in the past — you may have you may have not — but I just want you to know I never had an experience with you and I’m not here to do anything to you. And neither will my partners,” Thomas said. This story bears repeating and sharing everywhere, to show that officers are not uncaring drones that enact the will of the state. They are people that care about how others view them, and the state of ease in which the public goes about their day to day lives. These cops didn’t do anything extraordinary, but it does show that a little bit of kindness to the right people goes a LONG way. Would you like to buy these cops dinner? I sure as hell would!